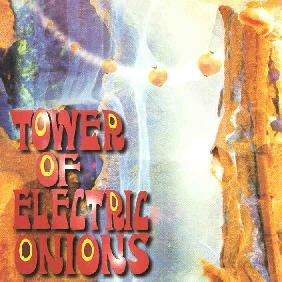 Tower Of Electric Onions - "s/t"
From Germany, Tower Of Electric Onions describe their music as "Afro-psychedelic-jazz-funk-rock", and cite comparisons such as Camel, Man, Nektar, and Pink Floyd. After numerous listens to this CD and a live CDR the band included I can say that Afro-psychedelic-jazz-funk-rock describes this band quite accurately, and of the comparisons they list Camel is most definitely the strongest and Nektar not too far off. The band consists of Berthold Campignier on hammond, keyboards, percussion, and vocals, Berni Özari on bass and vocals, Marco Schulte on guitar and vocals, Rafael Jarzabek on synthesizer, percussion, and vocals, and Frank Salz on drums. Tower Of Electric Onions are a tight ensemble of excellent musicians and the sound will sweep you back to the early 70's with it's killer combination of organ and rockin' fusion psych guitar. The album opens with "Dream(s)", which is similar to the great early Camel instrumentals. Marco Schulte and Berthold Campignier are very much a Latimer/Bardens pairing, though the music has a psychedelic quality. But when the band gets a groove going it's rock solid. "Chain Reaction" is a wonderful rockin' prog-psych tune on which the keyboards are king. "Spring" is the most classic prog rock sounding of the album's tracks. Not totally unlike the other songs but maybe with a bit of a Genesis influence. On the spacier side are "Caveman" and "Lobstrings". "Caveman" opens with spacey wind blowing synths, and the drums, bass, and guitar soon join in laying down a steady rockin' fusion pattern. Once the organ kicks in the band takes off with a potent melody that grabbed me right from the first listen. And for the last few minutes the Onions goes into a total foot tappin', head boppin' jazzy funky jam. "Lobstrings" opens with spaced out bubbling synths, soon followed by a thudding droning bass that lays down a pulsating beat along which a keyboard melody develops that is both haunting and serene. A really beautiful song with a full lush sound that still retains the band's trademark groove. My favorite tracks are "5/Tree" and "Moonlove". "5/Tree" is the shortest song on the CD, but this tune gets quickly to the point making it one of the fastest and funkiest of the Onions' tunes, and includes some of the most wailing tripped out guitar licks on the album. "Moonlove" is like an extended version of "5/Tree". Fast, funky, and trippy, this tune had me groovin' throughout it's 10 minute length. The all-too-brief killer guitar moments from "5/Tree" stretch out of bit more on "Moonlove", and what rippers they are! I'm not surprised that of the 7 tracks on the live CDR that these are the two from the CD the Onions perform. And I should mention that the live CDR gives every indication that this band is a smokin' unit in performance. In summary, Tower Of Electric Onions will appeal to fans of early 70's progressive rock that has strong psychedelic and fusion influences. The musicianship is excellent, the songs well arranged, and the music has a groove that will make your head swim. For more information you can email Tower Of Electric Onions at towerpromotion@gmx.net. Contact via snail mail at Tower Promotion; c/o Michael Müller; Postf.11; 56590 Horhausen; Germany.